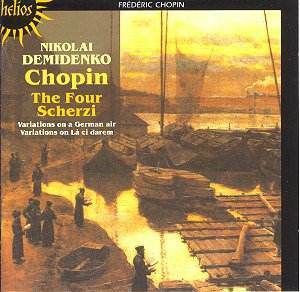 There is a great deal to enjoy in Demidenko�s Chopin, and though competition is stiff, you could do a lot worse if you�re in the market for a recording of the scherzos, especially at this low price. He became virtually the in-house pianist at Hyperion in the late 1980s and early 1990s, recording amongst other things more Chopin and the excellent Medtner concertos. He can be a volatile artist, rather in the Argerich manner, and his considerable virtuosity can sometimes run away with him, at least on the evidence of some performances (live and recorded) that I�ve heard. But here, the keywords seem to be poetry and restraint. Demidenko gives a clear indication of his intentions in the insert note, where he states �In Chopin musical power is not synonymous with physical power. Revealingly, you can contradict his loud dynamics without damaging his intentions�. He puts his money where his mouth is at the very opening of the First Scherzo in B minor. The opening two chords, marked fortissimo and then sforzando, are obviously a call to attention, designed to grab the listener�s attention for the turmoil to come. That�s how they�re generally played, at least by my available comparisons, Askenazy, Hough and Pletnev. With Demidenko, they are at most forte, or possibly nearer to mezzo forte, and it�s an odd effect, not what one is used to, but in some ways appropriate. Played this way, with the emphasis on the harmony and chord voicing, the initial impact may be lessened but the feeling is rather like an unsettling two bar prelude. The ensuing whirlwind is then even more effective. His passagework is immaculate, and when the fireworks are required, we certainly get them. But again, the Third Scherzo is less memorable for its opening double octave bravura (brilliant as it is) than the glorious chorale-like tune in the contrasting middle section. Time and again, I found myself sitting up and taking notice in these performances. The sheer sparkling élan of the Fourth Scherzo is simply a joy to behold, the exceptionally tricky rising and falling chordal figure realized with a glittering, improvisatory quality that Chopin himself would surely have applauded. He does stretch the limits occasionally in the slow sections, but such is the beauty of the tone produced that I never once took issue; as I did on an infuriating disc by Ivo Pogorelich some years ago. The two sets of variations might appear shameless show-stoppers, but again in the longer, more important set (on Mozart�s Là ci darem) Demidenko still tries to balance the phenomenal fireworks - which really are something - with structural and harmonic considerations. In other words he tries, in both cases, to make them pieces of music and not a sequence of encores. The recorded sound is excellent, the warm, sympathetic acoustic of Snape Maltings well captured by Hyperion�s engineers. You won�t really be buying this disc for the variations, and it�s true you can get rivals that offer better value, such as the lower mid-price Ashkenazy, who offers all four Ballades as well. But his recorded sound is very hard and clangy, and it�s slightly more expensive. Hough, the new in-house Hyperion pianist, also offers the Ballades but is at full price, as is Pletnev, whose Scherzos form part of his excellent Carnegie Hall recital on DG. So there really is a very good case for getting Demidenko�s intelligently played account; a real snip at the Helios budget price.